In preparing to draw Concrete Park, a constant issue when creating new characters (there are more than 100 speaking parts,) was keeping them consistent, what in animation would be called “on-model.” what better way than to prepare 3D digital models of the characters, models that could be posed in any configuration and rotated in space so that hey could be seen from any angle and in any light. Using the cheap, of-the-shelf consumer 3D software, Poser, I was able to fashion a number of such models and to create character guides both for myself and for other artists and colorists who would have to work with me. In addition to the character guides, I found I could use Poser to create backgrounds and environments that would be difficult to draw the first time, impossible to keep on-model in subsequent drawings. These environments can also be rotated, and the 3D “camera” can be moved anywhere in and out of them, to help give a great look to Concrete Park. “Vida Muerte” The undead assassin. 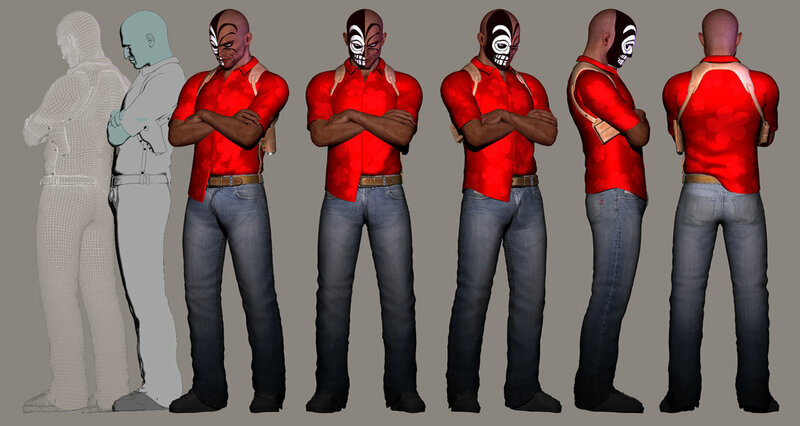 His Day-Of-The-Dead-inspired makeup must be drawn accurately, and this 3D model helps to insure that it will be. This is the Los Cruces prostitute “Xuxa” and her crib in “Heaven,” Los Cruces’s biggest whorehouse in 3/4 view. This is a front view of “Xuxa” and her crib, featuring the illuminated “Drink” sign outside her window.